TS Class Digital Classes Schedule/ Digital Lessons Schedule/ School, Class wise Time table(Schedule) / MANA TV live Programme schedule / Today TS Class MANA TV Programme Schedule/Digital Classes schedule for Digital Classrooms: TS Class Programme started in TS Digital Classrooms of TS govt Schools and these Digital Lessons are telecasting through MANA TV(SoFTNET) channel. The students can now understand the lessons easily due to video and audio systems enabled in digital method of teaching. The concentration of the students will increase enormously with the digital classes. The students also must work hard by learning the lessons perfectly asking whatever doubts they get while listening to the digital classes. By observing the visuals and listening to the audio, the students can enjoy the classes and remember the subjects easily which helps them to write the exams without any fear. Sub: Directorate of School Education - Academic year 2017-18 - Communication of Time Table for Digital Classes for Classes VI to X - Reg. All the DEOs in the State are hereby informed that the schools will be reopened on 12th June 20 I 7 after completion of summer vacation. The Digital classes 'are being conducted since the academic year 2016-17 onwards and will be continued during the current academic year of 2017-18. The details of the Digital lessons being transmitted from MANA TV is given hereunder: Daily five (5) digital lessons @ one (1) per subject will be transmitted from MANA TV. All the HMs may be directed to make ROT functional or take local cable connection with set top box to make use of live transmission. 1. The Digital lessons will be transmitted from second period onwards for all the working days i.e., the Second period for X class, third period for IX class, fifth period for Class VIII, sixth period for Class VII, seventh period for Class VI. 2. The actual transmission of the lessons is for 20 to 25 minutes and the remaining time will be for discussion based on the questions focused. The subject teacher must stay in the class room during transmission and engage the children and conduct post transmission activities. 3. Digital lesson registers shall be maintained recording day wise lessons, with topics, attendance of the children by the concerned subject teachers duly countersigned by the Head Master. 4. 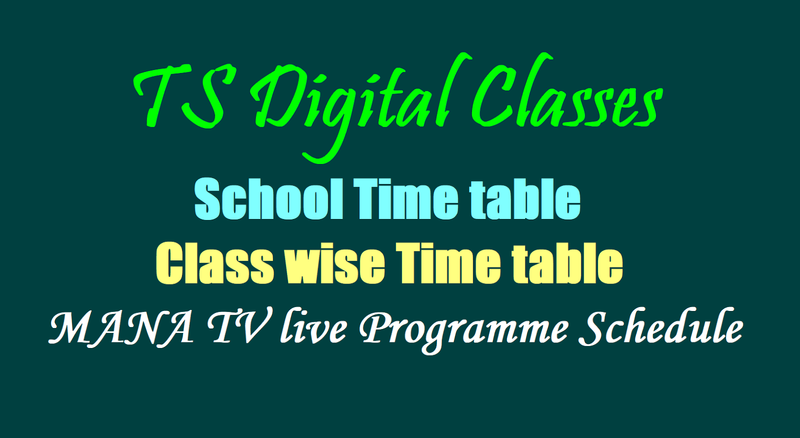 The time table of the digital lessons shall be displayed in the notice board and see the children come to the digital class room on time before starting of digital lesson. Following suggested / model time tables are enclosed for guidance. Therefore all the District Educational Officers are directed to communicate the same time tables and instructions to all the HMs of Secondary Schools and monitor for effective usage of digital lesson. Class - VI Telugu (5), Val. Edn (1) English (5), Maths (1) Social (5) PET (1) Genf Sci (3), Hindi (2) , . PET (1) Gehl Sci (2), Corn &WE (2) Art&CulEdn(1), Lib; (1) Maths (4), PET (1), Art & Cul. Edn. (1) DIGITAL CLASS (6) Science Lab. (1), Val Edn (2),, Maths (2)," Library (1). The School Education Director has issued orders to DEOs to make digital lessons available from the month of July 19 in the Upper Primary and High schools of the state. Digital Lessons will be available for students from 6 to 10 students every morning at 10.30 am every day. These lessons are to be taught by ROTs/ Cable TV broadcasts. The TS Govt strived hard since one week for introducing digital classes in TS schools. We will remember Digi Class launching date as a milestone date for long time to come. In previous days, students were receiving education in a Convention manner which we call the chalk and talk method. But now onwards students will notice a great change in the way education is being delivered to the students. They will enjoy attending their classes which will have lots of animation, graphics, multimedia. Delivering content from MANA TV site using your own imagination using their own creativity. They will also be able to come out with lots of content which SoFTNET will be using to enrich what SOFTNET have planned here. Digital Technology has been proven to be a success in improving the learning levels of all children in different parts of the world because we know that there are many concept which are complicated in nature and however good a teacher is unless the teaching is aided by pictures, visuals, graphics etc., the learning gets consolidated. And we have seen the tremendous success of online portals like Khan Academy, Byju classes etc cetera which have help tremendously in children improving the learning levels doing well in exams and also understanding concept from the very very basic level. In fact classes 6th, 7th, 8th, 9th and 10th or in way very very fundamental regardless of whatever profession you choose to become in the future. if you understand the basic concepts of all the subjects in these 5 classes whichever profession tomorrow you choose to get into this will stand you in very very good Stage. And there is no better way of learning these concepts then why using digital content. We are very happy that our education department of Telangana government has taken a very very good in every Revolutionary step to introduce digital classes under TS Class program in such a large number of schools. Typically which government agencies trying to test out new ideas by testing in 100 Schools, 500 School, thousands schools. But our Dy. Chief Minister and entire education department has motivated to reach out to as many schools as possible. The end of the year the govt should be able to reach all the High Schools in our state at from next academic year onwards. We will have not just one digital classroom but many distance classrooms in our state and tomorrow. When Telangana is recognised as a state which is on the front of digital Technology Revolution, the step that which way all initiative on the 16th of November will be remembered as a milestone step. The success of the ts class let us hope that TS Govt continue to maintain very high standards and deliver the best digital content to our students. We advised the students to concentrate more on studies for scoring good marks in the examinations and to get good name for parents and to the school staff. There are going to announces TS Gurukulum TGT PGT Recruitment 2017 for 7306 posts. Apply for TS TGT PGT Recruitment 2017 from Feb 10th.